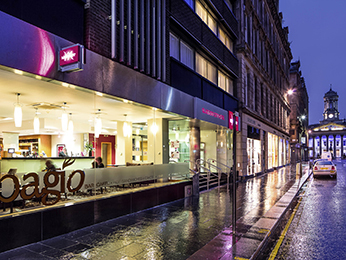 When it comes to hotels in Glasgow city centre, Mercure Glasgow City Hotel boasts one of the best locations in town. You’ll be surrounded by chic shopping with Merchant City, St Enoch and Princes Square right on your doorstep, and Argyle Street and Buchanan Street just one or two streets away. The hotel is close to all of Glasgow’s main attractions, including the Gallery of Modern Art, the Willow Tea Rooms and the River Clyde. The world famous Glasgow Cathedral and its necropolis are less than a mile away. The vibrant and stylish 3-star Mercure hotel features personalised service by our friendly, professional staff, complimentary Wi-Fi in all the rooms, and even has function rooms available for private hire. Glasgow is the biggest city in Scotland and is known for its culture, music, design and sport. It’s been awarded many prestigious titles, including the European City of Culture, the City of Architecture and Design, the Capital of Sport and a UNESCO City of Music. Glasgow has a number of must-see museums and galleries, such as the Kelvingrove Art Gallery and Museum and its surrounding Kelvingrove Park, the Hunterian Museum and Art Gallery with its impressive collection of Whistler artworks, and the Riverside Museum dedicated to transportation history. Music lovers should make sure to spend a night in some of Glasgow’s legendary bars. In particular, King Tut’s Wah Wah Hut and the Barrowland Ballroom are known for discovering some of the best British rock bands.